Terms and Conditions of 2019 Miele® Kitchen Package Rebate. (1) This promotional offer (the "Rebate") from Miele, Inc. ("Miele") provides an up to ten percent (10%) manufacturer's rebate on qualifying Miele appliances purchased together in a single transaction (the "Purchased Appliances"). To qualify for the Rebate, the customer must purchase from Miele one of the following combinations of Purchased Appliances: (a) one Qualifying Range,1 one Qualifying Dishwasher2 and at least one additional Qualifying Appliance;3 (b) one Qualifying Cooktop,4 one Qualifying Oven, 5 one Qualifying Dishwasher2 and at least one additional Qualifying Appliance;3 or (c) one Qualifying Rangetop,6 one Qualifying Oven,5 one Qualifying Dishwasher2 and at least one additional Qualifying Appliance.3 A Miele Range Hood Blower7 or Downdraft Blower8 (each, a "Blower Accessory") may be deemed part of the Qualifying Cooktop, Qualifying Range or Qualifying Oven, and Miele may apply the ten percent (10%) manufacture's rebate to the price of the Blower Accessory; however, no Blower Accessory shall be deemed a Qualifying Appliance for the purposes of this Rebate promotion. (2) The Rebate shall only apply to the advertised price of the Purchased Appliances and shall not apply to any installation services, taxes (including sales tax), delivery services, disposal services or any other fees. (3) Only end users (consumers) may benefit from the Rebate. The Rebate shall not apply to builders, wholesale buyers or any person or legal entity who offers for resale, or resells, the Purchased Appliances; in connection with such transactions or purchases, the Rebate shall automatically be void. (4) The Rebate may not be combined with any other offers, special or discounted pricing, or promotions. 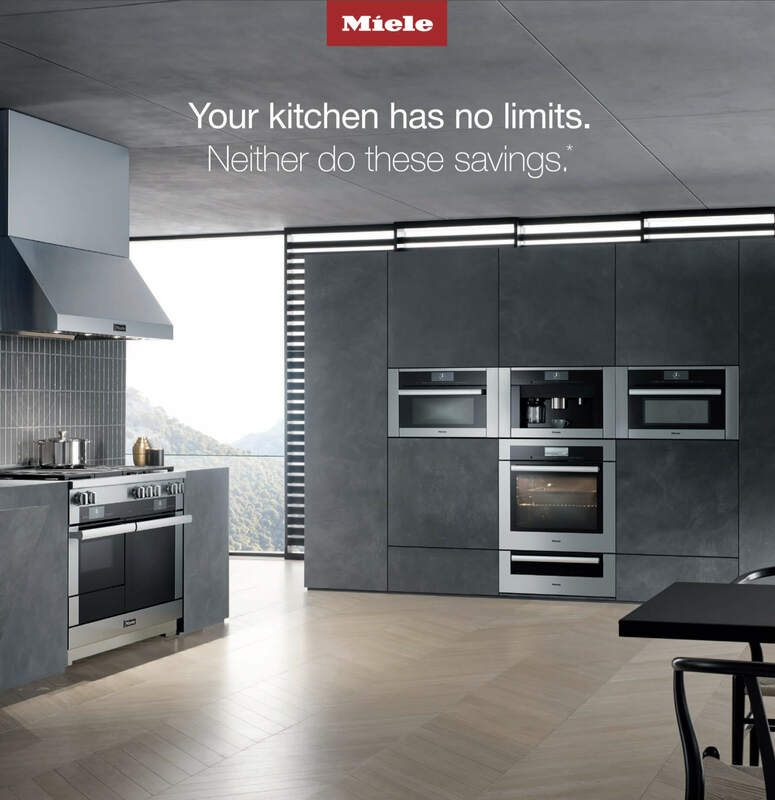 (5) The Rebate shall be valid only at participating authorized Miele dealers. For a list, please see https://www.mieleusa.com/domestic/find-a-dealer-384.htm. (6) The Rebate shall not be applied at the time of purchase of the Purchased Appliances. To receive and qualify for the Rebate, the customer shall submit an online or mail-in Rebate claim and copies of all of the required supporting documents (i.e., one or more valid order invoice(s), valid proof of payment and valid proof of delivery). (7) All Rebate claims shall be (a) submitted online at www.mielerebates.com on or before November 30, 2019, or (b) delivered by U.S. mail using the relevant Rebate order form with a postmark dated on or before November 30, 2019, to Miele Rebates PO Box 1919 Memphis TN 38101. (8) Please allow 6-8 weeks for processing and issuance of the Rebate. (9) If delivered by U.S. Mail, only originals of the required supporting documents shall be acceptable. Please make sure to make and retain copies of the originals and all documents related to the Rebate and the Purchased Appliances. (10) To qualify for the Rebate, the Purchased Appliances must be (a) (1) ordered in person at the store of an authorized Miele dealer, or (2) purchased online through an authorized Miele dealer during the Rebate period of January 1, 2019, through and including April 30, 2019 (the "Rebate Period"), (b) all on one (1) order submitted at one time (whether delivered or invoiced one or more times) and (c) delivered to the qualifying customer's address on or before October 31, 2019. (11) Purchases made on or before December 31, 2018 shall not qualify for the Rebate. Purchases made on or before December 31, 2018, and subsequently cancelled and reissued during the Rebate Period shall not qualify for the Rebate. Purchases made during the Rebate Period and subsequently cancelled and reissued after the Rebate Period shall not qualify for the Rebate. (12) The Rebate on the Purchased Appliances shall be limited to one (1) Rebate per household except in Rhode Island or where prohibited by law. (13) In the event any of the Purchased Appliances are returned to Miele or an authorized Miele dealer after a Rebate has been issued, the Rebate shall be forfeited and must be refunded to Miele in its entirety at the customer's expense. (14) The customer shall be eighteen (18) years or older. (15) The Rebate shall be voidable at any time at Miele's discretion if the customer shall not produce valid order invoices, valid proof of payment and valid proof of delivery, for each of the Purchased Appliances; or if the customer shall otherwise violate the applicable rules. (16) No substitutions shall be allowed. (17) The Rebate shall be available only to residents of the fifty (50) states of the United States of America and the District of Columbia. The Rebate shall not be valid for residents of Puerto Rico, the U.S. Virgin Islands and any other territories or possessions of the United States of America. (18) Any misrepresentation by the person placing the order, whether innocent or fraudulent, shall disqualify him or her from the Rebate and further rebates offered by Miele; Miele reserves its right to refer such person for civil or criminal prosecution. (19) Miele may amend or discontinue the Rebate at any time with or without notice, including after an order of Purchased Appliances is placed. (20) In no event shall Miele be liable for more than the amount of the Rebate. (21) The above terms and conditions are severable and, if one or more provisions shall not be valid under applicable law, the remainder shall be enforceable to the maximum extent permitted by applicable law.